Well, it's finally happening. We're living in a post-Emily world. Sad, I know, but at least this new world features ghosts! Okay, not actually ghosts - the three people standing around multiple personality guy are clearly just delusions, based on no one reacting to them but him, but I'm going to continue pretending they're ghosts for the remainder of the episode, because that's more fun. Also, the show cheats by having one of them hand the crazy guy a bag of chips. Unless they actually are ghosts, and can move things. While the crazy guy just wants to go home and sleep, his ghosts badger him into following a nurse home from the supermarket and then killing her. Wow, is it just me or is this going to be the easiest crime to solve ever? Bags of groceries in her house, so they head to the supermarket to check the security cameras, and see a twitchy guy following her. So, what, five-ten minutes tops? Over at Quantico Penelope and Derek are gazing sadly at the wall of fallen heroes, to which Emily's picture has been added. The wall seems to be directly outside of their offices, which seems like an odd place. Unless this is just a wall for profilers killed in the line of duty? No, that would be crazy. 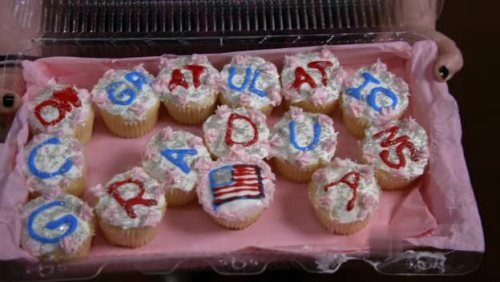 Anyhoo, things are brightened when Derek says that Emily would have wanted them to embrace her replacement, Rachel, and Penelope reveals that she's on top of it - having brought in cupcakes to celebrate Rachel graduating the academy! The joke is that Xander ate the last two letters. Which I'm mentioning here solely because it serves to remind everyone that Xander is still Penelope's boyfriend, despite him never appearing on the show, and also not being given his well-deserved spin-off role on Suspect Behaviour. There's a little pow-wow between Joe and Greg, discussing the fact that they desperately need a new profiler, and that while Rachel may help, she's just not experienced enough! Really, though? You already have four trained profilers and an apprentice working every case. Will throwing a fifth trained profiler whose opinions are completely interchangeable with yours really serve any purpose at all? I am curious to see who the potential new cast member is, though. The team is confused by the facts of the case, as the crime scene technicians report that eight different weapons were used on the latest victims, convincing them that a pack of criminals was involved! Right and left-handed wounds, some deeper than others suggesting different levels of strength. It's a mess. We already saw one killer, not wearing gloves. In the next scene he wakes up, tormented by the partying ghosts in the next room, and we see that he's so delusional that he didn't bother washing the blood off his bare hands before stumbling home and going to sleep. He stabbed the woman 40 times, and bludgeoned her with multiple additional tools - there would be blood everywhere. Wouldn't an ambidextrous killer be far more likely than a pack when presented with the evidence that the same fingerprints were on every weapon, and only one set of shoes left bloody footprints? Ah, maybe they'll figure it out when they get to the crime scene. On the plane the team continues profliing a pack of killers - even though they have extensive photos of the crime scene no one has noticed the footprint or fingerprint evidence yet. Also they know about the grocery store, but apparently no one mentioned the super-creepy guy who was mumbling to himself and harassed the victim while they were both at the checkout of an otherwise-unpopulated store. Do the regular cops in the world of Criminal Minds just not ask questions? Meanwhile the killer has a dripping faucet, so his ghosts suggest that they head to a hardware store to buy parts. The killer is reticent, because he knows they're going to badger him into killing someone, and he has no desire to do that. He's a fundamentally weak person, though, so he goes along with their desires. Actually walking around the crime scene finally allows Greg to notice the fact that every shoe is the same make and size, which the show tries to pass off as special insight, rather than the basest sort of observation. I mean, seriously, I learned how to make casts of animal tracks in grade school. This is not an advanced technique. Rachel and Reid do a little better, noting that the first victim was killed in an alley in a busy pedestrian area, meaning that the killer would have had to blend in with the mostly young crowd. 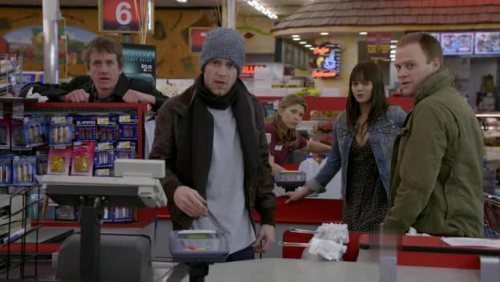 Derek goes to the supermarket and finds out about the creepy guy (so in the day after the murder the local cops did nothing? ), then offers some truly horrible insight, in what becomes the first newly-renamed 'Emily Prentiss (fake) Memorial Award For Stupidest Thing Said By an FBI Agent'. That's some amazing victim-blaming there, Derek! You know what the funny thing is? If she'd had a conversation with him, you'd be blaming her for engaging with the crazy person, and if she'd completely ignored him you'd have blamed her for irritating him. There's literally no way to predict the right way to respond to a psychotic person - that's what makes them psychotic. Yet Derek can't stop himself from suggesting that it was the victim's fault that she was murdered. The team jumps to the conclusion that the killer must be on a drug like PCP, that the adrenalin is leading to overkill, and the hallucinogenic effect makes him think he's seeing other people. Which is a nice theory, but why are they jumping to it? Although in the first murder he stole a computer and the like, suggesting a junkie looking for money for a fix, after the second murder he didn't do anything of the sort, which should call that assumption into question. You've chased plenty of people who overkilled recklessly without being on drugs, so why are you limiting the profile? I don't recall PCP being mentioned in the Richard Chase-based crimes from way back. That night the killer takes the hammer he bought at the hardware store and uses it to smash a guy to death. There's really not much in the crime scene - the guy was murdered in an apartment undergoing renovations. The question of why a guy was moving boxes of supplies into a work project at 3AM goes unexplored. The building has terrible soundproofing, though, which gives them an audio witness to the crime! First, though, Derek has to confuse her by asking about the UnSub. Oh my Christ, guys, stop saying that, and especially stop being so condescending when you explain it. You're like unpleasant teenagers using text-speak in real life, and then rolling your eyes when your parents ask you to use actual words. The witness actually has some super-useful information to offer - the guy was ranting about something that happened when he was a kid, and that he didn't want to kill any more. This finally clues the team into the fact that he's a schizophrenic, causing them to dismiss their PCP theory which was, of course, based on thin evidence that was already disproven. In the next scene we get a sense of just how crazy the guy is - he prepares some water with salt and then drips it over his head, flashing back to a time when a guy in a black suit did the same thing to him as a child. That's a really nice white shirt the kid is wearing, and the fact that he's below the guy suggests kneeling? Did he have a super-traumatic late baptism? The ghosts taunt him, saying that this won't help him, and reminding him that he's being punished for 'hurting them'. The killer calls his mother for help, and complains about the ghosts. She tells him to take the medication and pray, then go to the church for help. Then she hangs up on him, letting us get a sense of just how horrible his mother must have been to turn him into a monster. The team gives their profile, and the scene is actually relevant for three reasons. 1 - Reid is unable to focus, because the migraines are getting worse (possibly psychosomatic, since the case is reminding him of his own budding mental illnesses). 2 - In flashes to the killer trying to watch the church, the scene keeps focusing on one of the ghosts flicking a lighter open and closed time and again, suggesting that he burned something as a child. 3 - Derek announces that the guy's childhood trauma must have involved close friends or family. What is this based on? The fact that the killer had a 'limited social circle' as a child. Which is, of course, being invented out of whole cloth. They have absolutely no information that points in that direction, Derek (or the writer) is just making stuff up and hoping we won't notice. They also mention that if they find out what happened to him as a child and how a recent 'stressor' reminded him of that incident, they'll be 'that much closer' to narrowing down the killer's identity. Um... how could you find out those two things without also knowing his identity? There aren't going to be many ways to find out horrible childhood traumas without names being attached to them. Anything serious enough for there to be a searchable record will no doubt also give the names of the people involved, Derek. Okay, back to the killer, who, that night, heads to a church, looking for help. Or, you know, looking to kill a priest. I guess we'll see. The killer asks the priest to help get rid of the people who blame him for the fire. It seems a church group had successfully done it as a child, performing an exorcism on him! Interestingly, the ghosts are front and center among the parishoners who helped out with the rite. The current priest is skeptical about a new exorcism, suggesting that he instead go to visit a doctor. This freaks the killer out, and he gets more forceful in his demands for treatment. Before we see what happens, though, there's an interlude in which Derek confronts Reid about his behaviour, and they discuss the fact that this is the time when Schizophrenia presents, so of course Reid is right to be scared. Of course, that's not right, at least according to the show - Schizophrenia first presents from mid-teens to 25, and Reid is out of that window, as he's nearing 30. 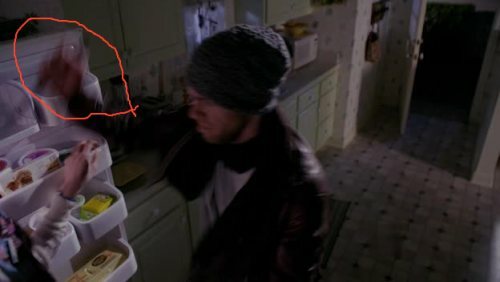 Reid also feels that they're missing something, since Schizophrenics are notoriously fractured in their thinking, and the killer is unusually focused. Of course, that isn't true either. Reid's mother was creepily focused on teaching her son about chivalry, Richard Chase was obsessed with his Angels - also, what exactly about this guy's behaviour does Reid see as anything but random and messy? The overkill? The poor hygiene? The complete lack of self-control? Greg calls Garcia, looking for information about mental patients, but she claims that privacy laws keep her from accessing a list of Schizophrenics. Again, this is the woman who checked the prescriptions records of EVERYONE IN AMERICA. Still, assuming they have to make this a little harder, they look into people who were arrested and also had mental problems. 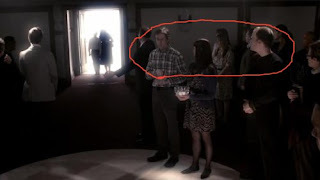 Then Reid is able to make a connection between the water and salt the killer was buying, and the fact that Schizophrenia is often treated with exorcisms by religious orders! Off to the churches in the neighbourhood where the killings took place! But will they find enough information from the priest to keep the guy from killing an old woman who he met on the bus! The priest fills them in on what parts of the guy's backstory he knows - the childhood fire, a stutter, and his history with exorcism. Oh, and the answer is 'no', the killer brutally murders the old lady, then spends the night napping in her blood. This tells Reid that he was killing to exhaust himself, meaning that he's an insomniac - which must be the missing variable! But will this insight be useful in catching him? While the team rushes over to arrest the killer he fantasizes about murdering his ghosts, but the respite doesn't last long. He tries to escape on foot when the team pulls pull up outside, which leads to a chase scene! 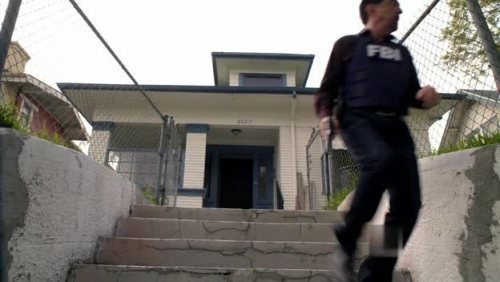 It also leads to us seeing that the killer was living in the most Los Angeles (and therefore least Portland) house ever. The killer sneaks into someone's house, hoping to hide out and maybe find another victim - he encounters two children, who naturally aren't in any real danger, then makes them spend a good thirty seconds closing drapes, rather than just hiding in the basement or upstairs or something. 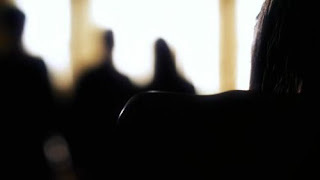 This movement is noticed the team, who enter the house and threaten him with guns. Even though he would be remarkably easy to shoot, what with his hostage being half his height, the team instead tries to talk him into dropping the knife. Because he's crazy, the killer hears this as a suggestion to stab Reid, which he attempts to do, but winds up shot for his trouble. This just reinforces why they shouldn't have been negotiating with a crazy person at all - what if he'd misheard Reid as suggesting that he slash the throat of the child he was holding? Then their failed attempts to talk down a psychotic spree-killer would have resulted in the death of a little boy, rather than just the near-death of an FBI agent. Am I finally going to get my werewolves next Halloween, Criminal Minds? I'd better! If it sounds like I'm going too far with this extrapolation, let me assure you that it's nothing the show didn't do first - in Rachel and Derek's conversation they admit that they flat-out had no idea what was wrong with the killer, since Schizophrenics don't start seeing visions at three years old. Mixed score this week - it takes some psychological knowledge for Reid to be able to drop the fact that mental problems are often confused with demons, which is what led them to the priest that the killer had confessed to. At the same time, they tried to negotiate with a man in the midst of a violent psychotic break, rather than simply shooting him, which put a child's life in danger. So how much credit do they really deserve? According to Garcia the killer had been arrested just recently. Yet they found no match for the roughly five hundred fingerprints he left at the various crime scenes? 3/10 - Isn't it interesting how this week while everyone was mourning Emily no one mentioned the fact that her 'killer', a famous international terrorist and the most wanted man in America, whose face would be on the news nearly 24/7, is still somehow on the loose? Funny, that. Especially when they offered no suggestion for how he could have possibly escaped capture last week. After all, he chose that random warehouse because it was where his son was fake killed, not because it had a secret escape tunnel left over from the days of the underground railroad. You should do a factcheck for this episode with Herbert Mullin. They were both schizophrenic, they killed for religious reasons, although when Ben Foster confronted the priest, he wasn't killed, while in the real-life instance, he was. Priests do not light candles (menial work for altar boys) and nobody lights candles in an empty church at night (they are primo beeswax and well husbanded). Maybe in another episode this "priest" will turn out to be a spree candle burning killer! Greg: His socks were nylon, not allowed by clergy. Damn Criminal Minds and its hatred of the mentally ill. "He was always a killer", Derek, really? At least this episode did something good in demonstrating how utterly terrifying it would be to suffer from schizophrenia. Try having those voices in your head and then see how easy it is to live by society's rules and conventions. Am I the only one who felt sorry for this guy? BTW, I'm liking the werewolf proposal - I'd like to see that, but I'm not holding my breath. What's your problem with Derek ? Sheesh. Psychiatrists have been aware of early on-set schizophrenia for at least the last twenty years. My brother is a paranoid schizophrenic. He began showing signs of being mentally ill when he was five years old. He tried to kill himself for the first time when he was five. He became homicidal at eight, although he never succeeded in killing anyone, this was partially due to disorganization and medication and partially because he did try to resist the demons. He was, however, very violent for a long time. The writers said a number of things that were wrong and/or misleading on this episode. My brother is now on the appropriate medications and hasn't had a violent episode in, at least, fifteen years so being a paranoid schizophrenic particularly with current medicines by no means automatically creates a killer. Many mentally ill people have loving and supportive families. Sometimes the illness is stronger than the environment. Oh and no schizophrenic who has shown signs of violence would be on only one medicine for schizophrenia. That is absurd. Okay, a few years ago in the US (about the time when they filmed this), the law cracked down on medical records being easily accessible. But the flip side is that every prescription is now reported to the state. Because... really long and involved reasons which wouldn't interest anyone but a news junkie like me. I'm curious how they handle this in Canada, seeing as you have a rational health care system.